When using Standard Pardot Forms, Pardot will provide HTML code in an <iframe> format to enable you to place your form on a non-Pardot hosted Landing Page. When using the Standard Chili Piper <> Pardot integration outlined here, the Chili Piper calendar will display within the iFrame that Pardot provides. Additionally, the redirect settings within your Inbound Concierge | Router will take place within this iFrame. Please make sure to have complete the steps for the Standard Chili Piper + Pardot instructions linked in the first paragraph before proceeding. In your Pardot Form, navigate to "Completed Actions" -> "Thank You Code"
You will need to define yourSuccessRedirectFunction & yourCloseRedirectFunction from the code below. You will need to set the Success and Close URL's for your follow up pages if you would like to send your prospects to different Redirect Locations depending on if they book or not. The setTimeout function is set to 5000ms or 5 Seconds for Success and 500ms or .5 Seconds for Close. You can edit this if you would like the redirect to happen faster or slower. You will need to add your subdomain and router parameters that are provided to you in your Inbound Concierge | Router. 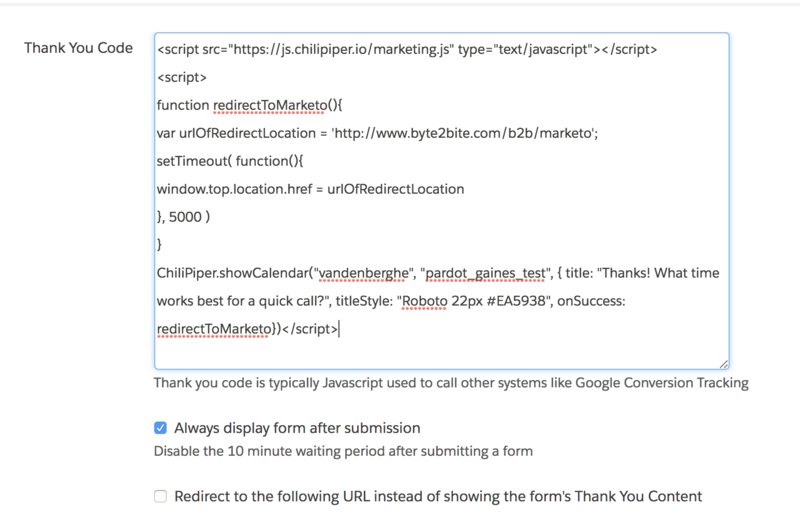 Disable the checkbox in your Pardot form to "Redirect to the following URL instead of showing the form's Thank You Content"
This will be handled with the code above. Uncheck the checkbox for "If users successfully schedule a meeting." Select "Take user back to form" for "Redirect for users who exit without booking a meeting". These redirect options will be handled with the code provided above. *Remember to use https://js.chilipiper.com/marketing.js instead of https://js.chilipiper.io/marketing.js as outlined in the picture above. ** The picture above does not use the onClose function, thus would only redirect the parent page upon a successful booking. 5. Save your form changes and test it out! - As always, if you run into problems or need some further guidance, give us a shout at support@chilipiper.com and we'll be happy to help out.